The Irish Independent recently found a new study where researchers suggest a scan of blood vessels in the neck during mid-life, could become part of detecting early signs of dementia (memory loss, confusion..) without the symptoms. 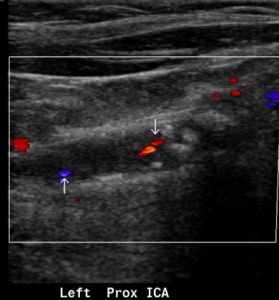 Here are the findings of a patient that recently attended our centre for a Carotid Doppler Ultrasound: (ultrasound of the blood vessels of the neck). The first image demonstrates the patient’s internal carotid artery almost completely blocked. This patient needs an urgent vascular consultation. The second image shows a normal internal carotid artery for comparison. Dementia affects up to 55,000 people in Ireland. 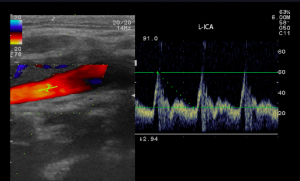 Visit our website to find out more about the Carotid Doppler Ultrasound we offer.